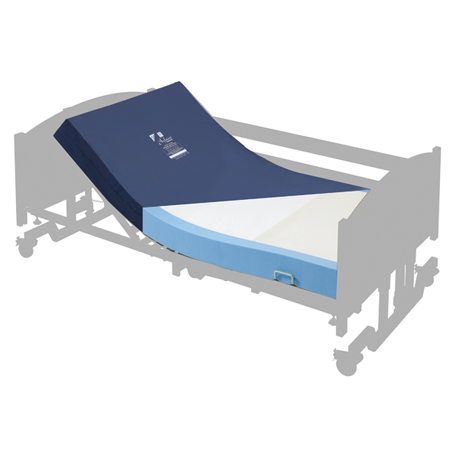 The Sidhil Acclaim Bariatric VE is a non-turning, high-risk support mattress. The mattress is manufactured using various grades of visco elastic foam, which has been engineered to work specifically with the Sidhil Bariatric bed (it may also be suitable for similar beds) and is for use with high risk patients. The 'U' foam construction of the side walls and base has been engineered to provide both added stability and strength, and to allow the mattress to contour with a profiling mattress platform. The mattress has a maximum user weight of 320kg (50st). The cover is made from a two-way stretch vapour-permeable PU coated fabric. Risk Rating High (risk patients) *Seek Professional Advice on suitability.